Robert is a Senior Associate in the Litigation Department. 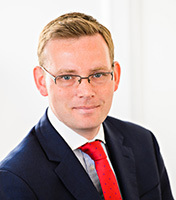 Robert advises principally in relation to civil and commercial litigation, traditionally with an emphasis on complex property related disputes. Robert also specialises in trust and contractual disputes, including professional negligence claims, acting for both Plaintiffs and Defendants. Before joining AFR Advocates, Robert was Head of Dispute Resolution at a well-regarded firm in England. He has also previously practiced in the London and Tokyo offices of an international law firm.